When it comes to cleaning an oil leak or any kind of stained concrete, it is important to know that you need a cleanser that will get deep down in the texture of the concrete. To save money, it is easy to make your own concrete cleaner and degreaser with items around the home. Many mechanics use this mixture to clean up the garage or patio after working on their cars at home. Borax or laundry detergent are the first ingredient in your homemade concrete cleaner. These products are good for removing basic dirt and some stains. When mixed with normal household vinegar and baking soda in a bucket with hot water, you get an effective grease cutter and cleaning product. When dealing with oil or grease stains, apply baking soda directly to the stain and allow it to sit for several minutes to soak up the grease before introducing your cleaning mixture. When the vinegar meets the baking soda there will be a fizzing chemical reaction that will break up and lift away the grease so that the detergent can remove the stain. 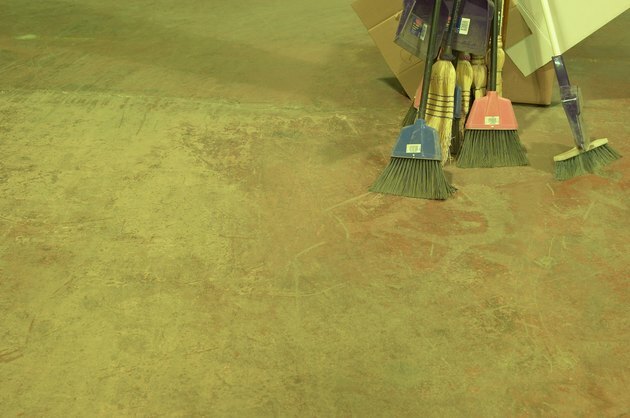 Scrubbing the concrete with a scrub brush or even a stiff shop broom will ensure that the cleaning mixture gets deep down into the texture of the concrete. Rinse your concrete with a water hose on full power to get rid of the dirt and debris along with the detergent. 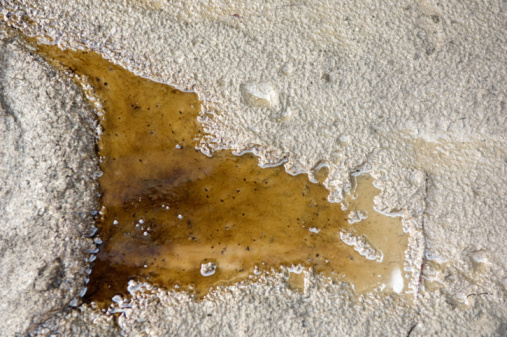 After drying, your concrete should be stain- and grease-free. However, depending on how bad it was to begin with, you may have to repeat the process several times to remove all stains. The lack of chlorine bleach in this mixture makes it safe for plants and grass that may be around the concrete.